The Next Big Thing Blog Hop is a chance for the author to respond to ten questions about her latest book – and then pass along this “chain letter” to another set of authors who will post on their blogs the following Wednesday. Here is my Next Big Thing! Please feel free to comment and ask questions. 2: Where did the idea come from for the book? I love writing triple stories – three heroes, three heroines, three romances woven into one book. So writing about two sisters and a brother was a natural setup for me – they’re all dealing with their overbearing father while they’re coming up short in the love department. 4: Which actors would you choose to play your characters in a movie rendition? I’m terrible at the movie game, so I’d love to hear what readers have to say about casting decisions. But I’d love to see Maggie Smith play the meddling old gossip Lady Stone, who appears in all of my Regency-period historicals. 5: What is the one-sentence synopsis of your book? The three Arden siblings – Lucien, Isabel, and Emily – go to their great-uncle’s 70th birthday gathering, where he’s promised to make their lives easier. But instead of receiving the financial help they’re hoping for, each one of the three falls in love. 6: Is your book self-published, published by an independent publisher, or represented by an agency? My agent is Christine Witthohn of Book Cents Literary Agency. This is my 85th romance novel but the first one to be published by Montlake Romance. Previously I was published by Harlequin and Sourcebooks, and I also write non-fiction. 7: How long did it take you to write the first draft of your manuscript? It takes me about four to six months to write each of my historicals – with at least that much recuperation time between books. 8: What other books would you compare this story to within your genre? Since I write complex stories involving three heroes, three heroines, and three romances ongoing within the story, the structure is actually more like women’s fiction than like the usual romance. 9: Who or what inspired you to write this book? (a) the mortgage. (b) chocolate. (c) more chocolate. 10: What else about your book might pique the reader’s interest? After writing 80 sweet traditional contemporary romances, I took a wild turn and changed everything I could – short to long, sweet to spicy, current-day to historical, US settings to England… If I could have thought of anything else to change, I probably would have. Readers may be interested to know that even this very dramatic change in story uses the same basic tools in writing. Also that I researched the Regency period for decades before I felt comfortable enough with the setting to actually write about it. Below are the links to the next chain of authors, who will be posting next Wednesday. Be sure to bookmark their sites and add their new releases to your calendars. Happy Writing and Reading! Elke Feuer is a debut author with Crimson Romance. In For the Love of Jazz, she brings Jazz Age Chicago back to life when a contemporary heroine finds clues to her family’s past. Find out more at http://elkefeuer.com , or follow her on Twitter. Laura Navarre writes Tudor-era (and earlier) historical romance, often with a paranormal touch. Her latest release is By Royal Command. Find out more at www.LauraNavarre.com or Facebook. 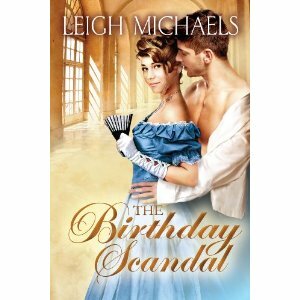 I really enjoyed reading The Birthday Scandal. I loved this group of spunky siblings and the interactions with their overbearing father. Thank you, JL! I am so proud of you, and I really enjoyed seeing how you brought Cruz and Amanda together in Outmaneuvered. Love your inspiration for the book LOL, and I'm so glad it's finally out! Rest fast so you can start the next one!